Type 1 diabetes afflicts some 30,000 Americans every year. The disease is marked by a complete shutdown of the body's insulin production. It requires regular blood testing and insulin injections throughout the day. It's a burden. But a new artificial pancreas could soon change the entire process of regulating a patient's glucose by making it all completely automatic. 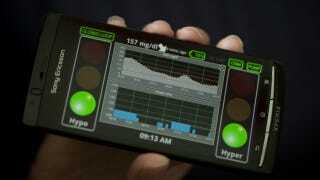 The system was developed at the University of Virginia as part of the Juvenile Diabetes Research Foundation's (JDRF) Artificial Pancreas Project in conjunction with the University of California, Santa Barbara; Montpellier University Hospital in France; and the Universities of Padova and Pavia in Italy. Patrick Keith-Hynes, PhD, and Boris Kovatchev, PhD led the research team. The device itself works in two parts. First, a conventional insulin pump and continuous glucose monitor (CGM) are implanted in the patient. An insulin pump is a small device that pumps the hormone subcutaneously throughout the day as levels drop; a GCM monitors blood sugar levels and alerts the patient when action is necessary. Problem is, this setup still requires the patient to regularly check and tweak the pump's output. Sure, it's a step up from constant pricked fingers and syringes, but it is generally still quite a hassle. The second part of the system, and the crux of this new development, is...a modded mobile phone? The team has reconfigured an off-the-shelf cell phone to act as the system's brain—automating, in real-time, the process of monitoring and adjusting insulin levels. The JDRF has already received FDA approval for outpatient testing of the new system and has just recently begun the first round of tests. Justin Wood of Charlottesville, VA, age 40, was the first American to take it for a spin. "The device automates a lot of the tracking and monitoring I do now," he says. Previously, he had to abide by a strict regimen of a low-carb diet and up to five finger pricks a day to monitor his sugar levels. However, he believes that with this system, he'll be able to eat more freely, and reduce his number of sore digits to just two per day. According to Wood, this device is "a step forward in technology that could change my view and outlook on life."